CEOs from the world’s leading institutional investors – representing more than $12 trillion in assets – including OPTrust have signed an open letter to the G7 Finance Ministers urging them to support the inclusion of a long-term emissions reduction goal in an international climate agreement which is expected to be signed in Paris this December. This is the first time a global coalition of investors has called for a long-term emissions reduction goal to be included in the Paris agreement. 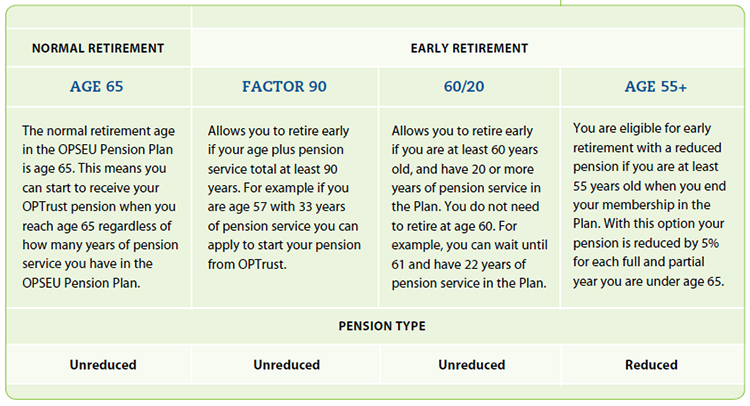 Want to know how your pension plan remained fully funded? Interested in how OPTrust is delivering sustainable pension security for the long term? Looking for the latest on OPTrust’s investment performance? Just turn to the special pullout section inside this newsletter to read the Report to Members 2014. There you’ll find key statistics on the financial performance of the OPSEU Pension Plan and news on how we serve you and our 86,000 other members and retirees. More information on OPTrust’s strategy and performance is available in our online report at optrustannualreport.com. OPTrust has come a long way in 20 years. In just two decades, the Plan and the organization that supports it have grown from modest beginnings to become one of Canada’s top public sector pension plans. OPTrust at 20 is a sophisticated global investor, a leader in service excellence and one of a select group of pension plans that is fully funded. As you can see, we’ve had major achievements in the last 20 years. And we’ve never lost sight of our primary goal – to pay pensions today and preserve them for tomorrow. In other words, our 86,000 members can count on us for a predictable, steady stream of retirement income for the rest of their lives. OPTrust’s pension estimator lets you see the big picture of your pension income with a range of possible retirement dates. This popular online tool makes planning for retirement that much easier. Ready to generate an estimate? Sign in to your Online Services account and go to “My Pension Estimates” from your secure home page. The estimator will automatically generate your earliest unreduced retirement date, and the annual pension amount you will receive before and at age 65. Once you click “Get more details” you’ll see the big picture with your personalized pension information. Your online pension estimate provides a detailed breakdown of how your pension is calculated, when you can retire and what you will receive at retirement. The estimator shows your current data unlike your Annual Pension Statement, which reports your pension information at December 31 for the previous calendar year. OPTrust’s pension estimator continues to gain popularity among members. The use of the online tool more than doubled at the end of 2014 with 38,081 estimates generated up from 16,735 in 2013.
sign in or register for OPTrust’s Online Services. In March, Hugh O’Reilly, President and CEO of OPTrust was the keynote speaker at the C.D. Howe Institute Roundtable. Mr. O’Reilly’s speech titled Pensions as Problem Solvers: The Future of Retirement in Ontario outlined the organization’s position on the Ontario Retirement Pension Plan. It also explained how public sector pension plans such as OPTrust can support the province as it moves to redefine the retirement income system. C.D. Howe Institute roundtable sessions are off-the-record events which encourage business leaders, policy makers and scholars to have frank discussions about thought-provoking issues. OPTrust posted Mr. O’Reilly’s remarks with the permission of the organizers. The full speech is available online. OPTrust’s Member Services department recently completed its Centre of Excellence project – a two-year initiative focused on enhancing the way it operates though education, innovation and service. At its core, the Centre of Excellence project has helped to transform the way we provide service to our members. As a result, our service approach has evolved from a focus on transactions to one that is centered on providing our members with a superior customer experience. a greater focus on staff training and development initiatives to ensure that our staff is equipped with a deep understanding of how to anticipate and assess your needs before they arise. While we have always focused on delivering strong customer service, our Centre of Excellence approach takes it to the next level. We want you to feel that you are valued and respected at all times. Ultimately, our goal is to make your pension plan one of the best service delivery organizations you deal with. It’s clear our members value the new streamlined model and our personalized approach to customer service. In 2014, we delivered our highest client satisfaction scores to date – an overall score of 8.9 out of 10. Question: Can I use my RRSP to buy back pension service? Answer: Yes. You can transfer funds from your RRSP account to buy back pension service. You will need to complete OPTrust’s RRSP Direct Transfer form for the payment. The form is used to transfer funds from a registered retirement savings account to the OPSEU Pension Plan. It is available on our website under “Buying Back Pension Service” in the member section. Question: I have 20 years of pension service. If decide to leave my job at age 55 do I have the option to collect an unreduced pension when I turn 60 or do I have to wait until age 65? Answer: You can start your pension at age 60 but your pension will be reduced by 5% for each year you are under age 65, i.e. a 25% reduction. Although you have 20 years of pension service, if you leave your job at age 55 you will not qualify for the 60/20 unreduced retirement option. This is because you are not yet age 60 at termination and you don’t qualify for another unreduced retirement option such as factor 90. Question: How is my best five-year average annual salary calculated on my Annual Pension Statement? Answer: Your OPTrust pension is calculated using your highest consecutive five-year annual salary rates during your membership. The best average annual salary as of December 31, 2014 is shown on your statement. For a complete breakdown of your best five-year average annual salary sign-in to your secure Online Services account. 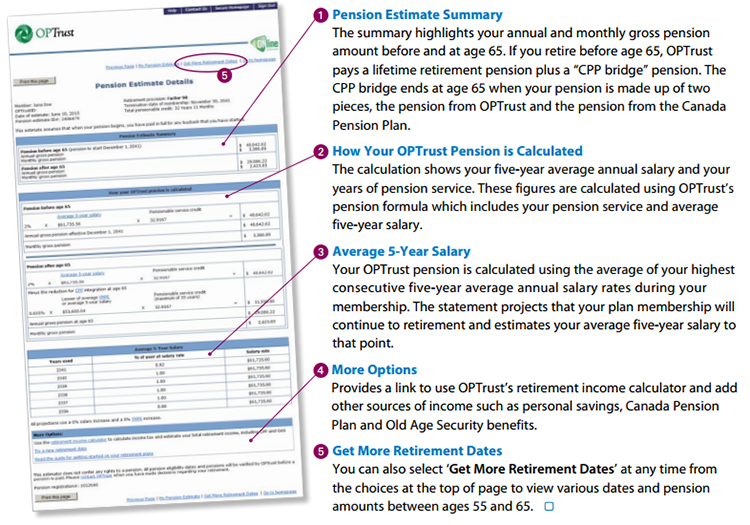 Read more about OPTrust’s pension estimator. Question: My 21-year old daughter is graduating university soon, does this mean she can no longer be my pension beneficiary? Answer: Once your daughter has graduated she is no longer considered an ‘eligible child’ under the Plan. However, you can name your daughter as a pension beneficiary for your survivor benefits. Sign in to your secure Online Services account to update your beneficiary information or complete OPTrust’s Pension Beneficiaries form. Our online video Plan ahead for your survivors gives you an overview on designating a beneficiary. Question: I’m planning to retire in December 2015. What information is required to start my pension? Answer: Now is a good time – approximately six months – to start the process of retiring. Waiting only a few weeks before your retirement date could cause delays in your first pension payment. You will need to inform your human resources office. They will have the necessary forms that must be completed to start the process. OPTrust requires a VOID cheque, updated beneficiary information, your employer’s retirement forms, and proof of your marital status. Question: Where can I find out what OPTrust invests in? Answer: A list of OPTrust’s significant investments for each of the Fund’s asset classes is available online. You can also download our full annual report for a detailed description of the Plan’s investment performance during 2014. Like all OPTrust members, you are contributing to a secure retirement with a steady stream of income you can count at the end of your career. As a member of a defined benefit plan you will receive a pension payable for your lifetime and it will grow with inflation for you and your survivors. While you are building your pension and planning for the future, understanding your retirement options and when to start your OPTrust pension may help you with your financial goals. Depending on your years of pension service, you may qualify for early retirement with an unreduced pension, normal retirement or a reduced pension, under the Plan’s current provisions. Want to stay up-to-date with OPTrust and learn about our latest news, investments or jobs? Follow us on LinkedIn and get information about your pension plan every week. From our investment performance to our approach to responsible investing and more you have access to a range of news and events on our LinkedIn page. Simply go to LinkedIn and search for OPTrust. If you are a LinkedIn member, click the “Follow” button and you will be notified any time new information is posted to our page. We encourage our members to share OPTrust’s news articles, comment on and “Like” our posts because this is your pension plan. OPTrust has been shortlisted for the third consecutive year, for a global award recognizing excellence in responsible investment reporting. The RI Reporting Awards showcase excellence in responsible investment and environmental, social and governance (ESG) reporting encouraging best practice and transparency. Of the more than 1,000 global fund reports analysed, 16 are on the shortlist – eight in the large funds group and eight in the medium and small fund group. OPTrust is the only Canadian plan nominated in the medium and small fund group. Responsible Investor (RI), a dedicated news service on reporting responsible investment, ESG and sustainable finance for institutional investors globally, administers the RI awards. OPTrust has expanded the Fund’s reporting on our RI activities in our online Responsible Investing Report released in December 2014. The report highlights our strategy for investing responsibly for long-term sustainability.